Our trip around St Lucia introduced us to the people and the flora and agriculture of the island. It's hard to tell which was more beautiful! Our tour was led by the ambitious and knowledgable Shane with Real St Lucia Tours. As his car attests, he works hard for his guests and he shared many facets of St Lucia with us during our day on the island. Of course the big "story" of St Lucia are the beautiful geological formations on the coast known as Petite and Grande Piton. We saw many tropical plants, that ordinarily only grow inside homes of offices in our own area, but here they were growing everywhere in this rainforest environment. The rainforest flowers above and below support life within their blooms by holding onto water which allows the hummingbirds to sip, small insects and frogs to live and also for epiphytes (air plants) to grow in the tiny "bowls" created by the blossoms. ...but as soon as the blossom is touched by human hands, it withers and dies without producing any seeds to reproduce. At the Botanical Gardens they all had a sign that said, "do not touch", but at the Tet Paul Nature trail, they did not and several had been to irresistible to guests and looked like the one below. Our guide explained it had rotted and would not produce seeds. This tree was not at all like St Lucia- which we found very welcoming. This tree with its sharp spikes was not hospitable to man, bird, or lizard! Ouch! We also had a chance to see some of the agriculture of the island...in addition to the banana plantation, which is the biggest export from St Lucia (mostly to Great Britain) in the first photo, we also saw a mango tree in blossom with tiny mango fruit just starting, smaller than a pea! And nearly ripe mangoes below. 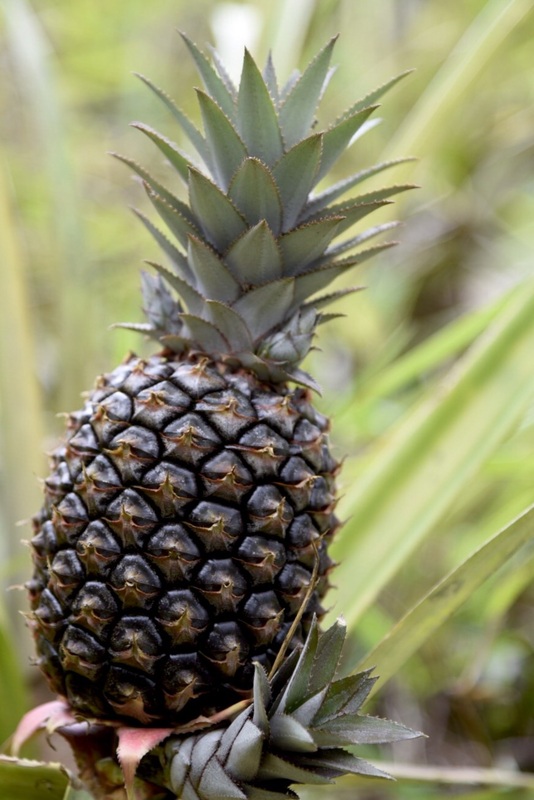 Pineapples do not grow on trees but on plants with spiky leaves near the ground. Each one can grow 4-5 pineapples on the plant. Then the plant dies and pineapples need to be replanted. Of course a new plant will grow from the top of another pineapple, so they are easy to grow! Even more beautiful than the flora, were the welcoming and friendly people of St Lucia. Even the folks trying to sell something were very positive, reminding us they needed to "make bread, mon". Below are some folks in a shop along our route. These school girls were caught in the rain after school, but it didn't stop them from smiling and waving to us as we went by! We had decided before we left to try not to be the kind of tourists who "touch the flower and ruin it". We had heard of an organization called Pack For A Purpose. (http://www.packforapurpose.org) This organization offers communities around the world an opportunity to share a wish list with travelers who might be going there. You simply collect the wish list items and "pack for a purpose", bringing along items easily sourced in the US and delivering them to people in need. The very last thing we did in St Lucia before we left was to drop off a whole bag of school supplies (flash cards, crayons and pencils etc.) we had collected from our own community. We were able to deliver these to the Sandals LeToc, where the Sandals Foundation helps supply and fund 2 preschools in the area. We were met by a Sandals executive who thanked us for participating and we know that the suplies will be well used, because the following day in Antigua our guide explained that her daughter goes to a preschool that is supported by the Sandals Foundation and they do many worthwhile projects and help supply the school! It was great hearing first hand that our small contribution makes a difference in the lives of ordinary people where we visit!